OK folks, this is the complete list of all the items, INCLUDING all the extra info you might need such as where they come from, what original missions unlocked them and what rewards you're going to see from doing them. PLEASE NOTE: Homestead drops will only work when you have the current missions open for them, they will not drop if neither the original mission or the Supply Depot is asking for them. We do not know which will open at any one time. 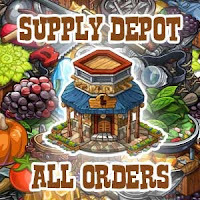 Sieve Stations can also drop from the Build O Matic Manufactured Crate, the Dino Exhibits, Spirit Bonfire, Spirit Buck and Fortune Frog Daily Bonuses and Weighing Bred Bunnies and Judging Runts (score 23-33), Sending an Animal Companion on a Mystery Quest, the Lumber Tree Quilting Patch, Healing Geodes, the Steamin' Crate and Cooking Daily in Bo's Kitchen. Honeydew Melons can also drop from using Orange Pieces in a Stained Glass Window, green patches on a Quilt, Wilderness Crates, from the Daily Bonuses of the Crazy Cornucopia and Spirit Bonfire, Healing Geodes and Pilfered Payloads (stages 2,3) and Cooking Daily in Bo's Kitchen. Lavender can drop from from the Daily Bonus of the Crazy Cornucopia, using a faded purple patch in a Quilt or the Spirit Bonfire Daily Bonus. Juniper Berries come from the Survey Collection, Healing Geodes and Pilfered Payloads (stages 2,3) and Cooking Daily in Bo's Kitchen.